Updated Sunday February 18, 2018 by Tom Simon. If you're like I was, the first tee-ball game you'll see is one in which you're coaching. Let me give you some ideas of what to expect. First off, the rules: Every player bats in every inning. All but the last batter stop at first base and advance one base on each hit. The last batter circles the bases. That's it. Nobody keeps track of outs. One reason is that few are recorded. During an entire season, we had one batted ball caught in the air in a game and one in practice. Sometimes the first baseman fielded a grounder and beat the batter to first base. And on a few special occasions, the pitcher actually fielded a grounder and made an accurate throw to the first baseman, who caught the throw and tagged first base before the batter. But those occasions were rare. Between them, the pitcher and the first baseman account for 90% of the fielding action, so it won't take long before your players are clamoring to play those two positions. You should rotate your players so everybody gets a chance to play each position. The easiest way to do this is to have each player move one position each inning (i.e., the first baseman becomes the second baseman, the second baseman becomes the "person who stands on second base," the "person who stands on second base" becomes the shortstop, the shortstop becomes the third baseman, the third baseman becomes the pitcher, and the pitcher becomes the first baseman). The problem is that during a three- or four-inning game, not everybody gets to play pitcher or first base, and the player who starts at pitcher (or third base) plays half the game (or more) in the "action positions." I tried to even things out by keeping track in my head of who started where in each game, but I don't feel that I ever came up with a satisfactory system. If you have a half-dozen or so players per team, you should be able play at least three innings in an hour; if you hustle, you might squeeze in four. Tee-ball tradition dictates that at the end of each game, you give a cheer for the opposing team ("Two, four, six, eight, who do we appreciate? Light Blue Lake Monsters! "), followed by the line of handshakes. The cheer is old and lame but I never took the time to come up with a better one. Maybe you will. Resist the urge to "coach pitch" during games. Yes, most of your players will be able to hit a pitched ball, but nobody wants to wait through ten or more pitches for the one who can't. If you "coach pitch" in practice, the proper technique is like throwing a dart, with the foot on your throwing side forward. On the subject of practice, I tried to hold one each week but it was difficult to get a real field to ourselves (the softball players stake out Smalley Park even before 5 p.m.), so typically we set up our own field at lower Calahan or Champlain School using the orange rubber bases. After playing catch while waiting for all the players to arrive, I had the players spread out along the first-base line for some stretching, mainly to introduce them to the concept. (This was also a good time to discuss any issues that came up in the last game.) Then, because they loved it and because every parent appreciates the cooperativeness of a worn-out child, I had them run -- a lot. Lining up at home plate, the players swung an imaginary bat and then sprinted to first base, making sure to run through the base. After doing that several times, I had them run around the bases two or three times, swinging the imaginary bat and taking off as soon as the player in front of them touched second base. (Around midseason I taught them how to "round the bases," though I don't know that it ever really sunk in.) We repeated this before each of our games. The bulk of each practice was hitting off of the tee, with the players in the field changing positions after each batter. Then, at the end of each practice, I came up with a drill that worked on some aspect of baseball that we had failed to do well in our last game. For instance, after a game in which our pitchers were consistently battling our infielders for ground balls, I introduced the "Pizza Drill." I lined them up in a semi-circle, then told them to cover only their own "slice" as I tossed grounders between them. It's important to keep your expectations reasonable, and to that end I set only three goals. First, I wanted my players to learn how to run the bases properly. Second, I wanted them to learn the names of the different positions and where they stand on the field. 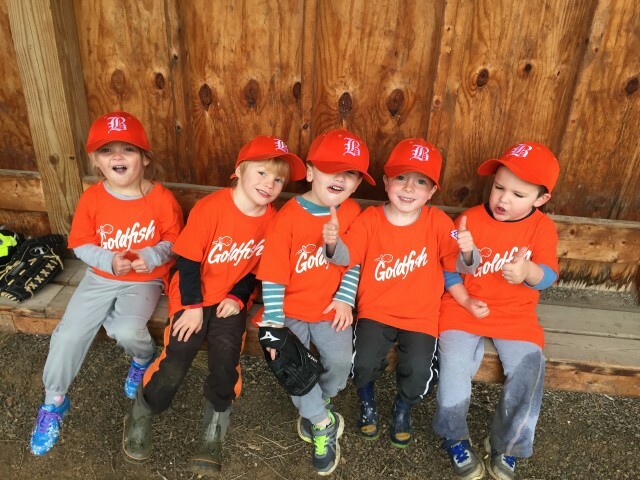 The most important goal, of course, is to have fun and provide a positive introduction to team sports (and baseball in particular). Tom Simon was the coach of the 2009 Green Lake Monsters. If you have any questions about tee-ball, Tom will be happy to try to answer them. He can be reached at tps@mc-fitz.com.